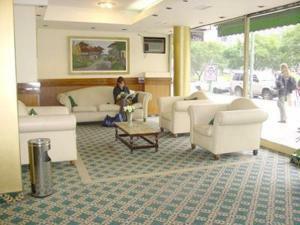 Embajador Hotel, Buenos Aires discount hotels and accommodation. Excellent downtown location, a few meters from well know and fashionable Santa Fe Avenue. picturesque San Martin Square, and world famous Florida Street, where visitors will find the most modern and sofisticated stores and boutiques, bearing High Fashion brand names. Also a few minutes walk from the city financial and business center.Our Hotel, offers 52 outside view, air conditioning and tastefuly decorated rooms. Distributed along 12 stores, all rooms combine a cozy atmosphere, with spectacular views of one of our most famous avenues 9 de Julio reputed as the widest avenue in the world. View photos, room descriptions and make online reservations at Embajador Hotel. Save on room prices at Embajador Hotel, Buenos Aires.